Free-flowing Northampton Saints took the East Midlands derby honours with a dominant 29-15 win over Leicester. Tom Collins scored two first-half tries for the visitors as they built up a winning lead following Mike Williams' yellow card at Welford Road. Saints scrum-half Cobus Reinach was instrumental in the first half, scoring the first try after just five minutes. Dan Biggar kicked 14 points for Saints, Leicester's two late tries coming from George Ford and Tom Youngs. Leicester welcomed back five England players from the Six Nations, while Saints made eight changes from the side that won the Premiership Rugby Cup last weekend. The game hinged on two decisions that both went against the home side in the first half. First, Taqele Naiyaravoro knocked on in the lead-up to Reinach's try, the South African being played in after a storming run from his own half by Collins. And, after a period of Tigers pressure that yielded just a Ford penalty, Williams was yellow-carded for illegally stopping a Reinach break. With Williams off the pitch, Collins scored two tries - the second after a wonderful reverse offload from Naiyaravoro - as Saints stretched their lead from 5-3 to 20-3 at the break. 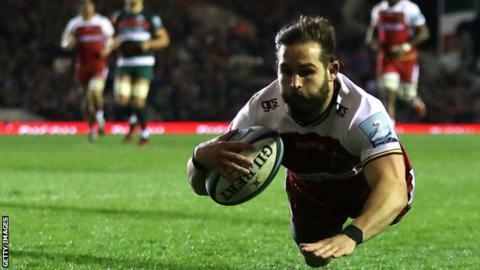 Before the card, Reinach made try-saving tackles to deny Sam Aspland-Robinson and Dan Cole as Leicester looked for the big score after a series of penalties. The game was much tighter after the half-time break - which included a wedding ceremony on the pitch - but Cole became the second Tiger in the bin and Grand Slam winner Biggar stretched the lead to 29-3 with three penalties. Biggar was denied the bonus-point try when his score was ruled out for a forward pass but Saints were worthy winners as they looked to run the ball at every opportunity. Ford and Youngs added late tries for the home side, who stay 10th in the Premiership, Saints moving up to fifth. "I feel sick, to be honest. It was incredibly disappointing. The top four is going to be very difficult for us new and so is the top six. "At half-time there was a mountain to climb. We looked a bit shell-shocked on the back of their breakaway try, we looked rattled and they then scored another try. "Mike Williams got himself sin-binned and Dan Cole got binned too for playing the ball when he shouldn't have. They were naive penalties. but they both looked yellow cards. "It makes you question everything you're doing. The guys are working hard but we're making very silly mistakes. It's not because the guys don't care. It's because they care too much." "It's my first experience of Welford Road and it's a very memorable one. It's a good victory and we'll enjoy it, but a good performance is even more enjoyable. "For 60 minutes we were pretty tidy. They needed the points like we did and after winning the Premiership Rugby Cup last weekend, it's been a good few days for us. "This fixture last season was when Rob Horne had his career-ending injury. We set up the Rob Horne match against Leicester at Twickenham and were terribly disappointed with the way we played. "I thought we disrespected that occasion, so there was a little of an extra bird on the shoulder for Rob. That was part of the motivation." Leicester: Olowofela; Aspland-Robinson, Tuilagi, Eastmond, May; Ford, Harrison; Genge, Youngs (capt), Cole, Spencer, Kitchener, Williams, O'Connor, Thompson. Replacements: Kerr, Gigena, Heyes, Wells, Fitzgerald, White, Toomua, Owen. Sin-bin: Williams (30), Cole (53). Northampton: Tuala; Collins, Hutchinson, Francis, Naiyaravoro; Biggar, Reinach; Van Wyk, Fish, Hill, Moon, Ratuniyarawa, Gibson, Brussow, Harrison (capt). Replacements: Marshall, Waller, Franks, Craig, Wood, Mitchell, Kellaway, Furbank.